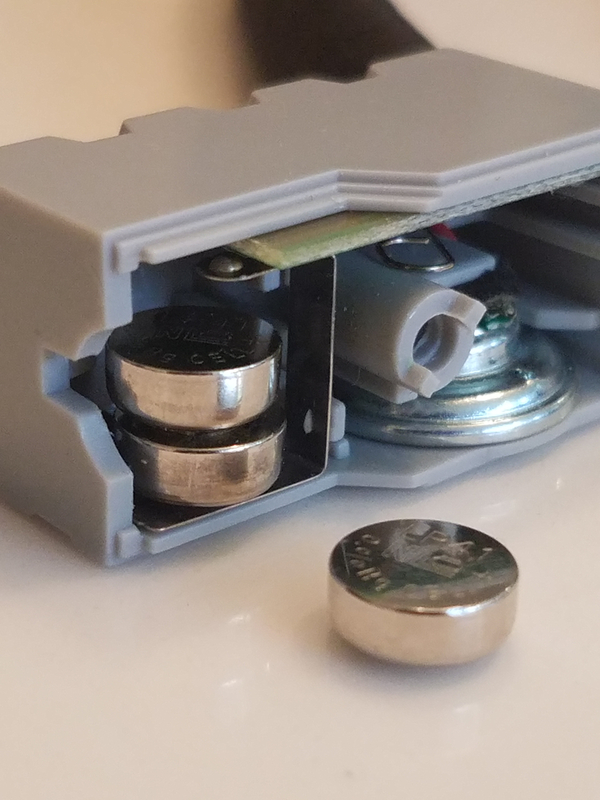 I have a couple sound bricks that need their silver round LR41 batteries replaced, however they're as small as aspirin & for the life of me I cant get the 3 of them back in there! Any techniques or tips? It's easier said than done. I'm using tweezers to "stack" them, but the middle one keeps getting pushed back & knocked over. Bottom batt in first? Then 2nd? Or bottom-top-middle? Tip the brick on its side? Keep it flat? I dont want to force it because this particular sound brick gets really expensive. TIA!!! I've not done it in this one, but usually putting the middle one in first works best. Lay it flat and push the middle battery down into place. Then what would hold the middle battery in place? Make a "ribbon" using 2 bits of tape stuck face-to-face. Stack all 3 batteries and then wrap the ribbon round the back of the battery stack and pinch it tight at the front. You should be able to push all 3 in at once without them moving if you pinch it tight enough at the front (might need to trim the tape to the same height as the battery stack). Tape ribbon should slide out once batteries are in place. Sorry, middle one in last, not first! Presumably that metal strip is not continuous from top to bottom, as it looks like it will short circuit. Is there another contact under what is currently the bottom battery? Some cheap batteries are not very consistent in thickness, so you might want to try others to see if they fit. If there is some wiggle room, you might be able to bend the upper contact slightly to get them to fit. Even if you break them, they look like they would be easy enough to repair by solding a wire instead. 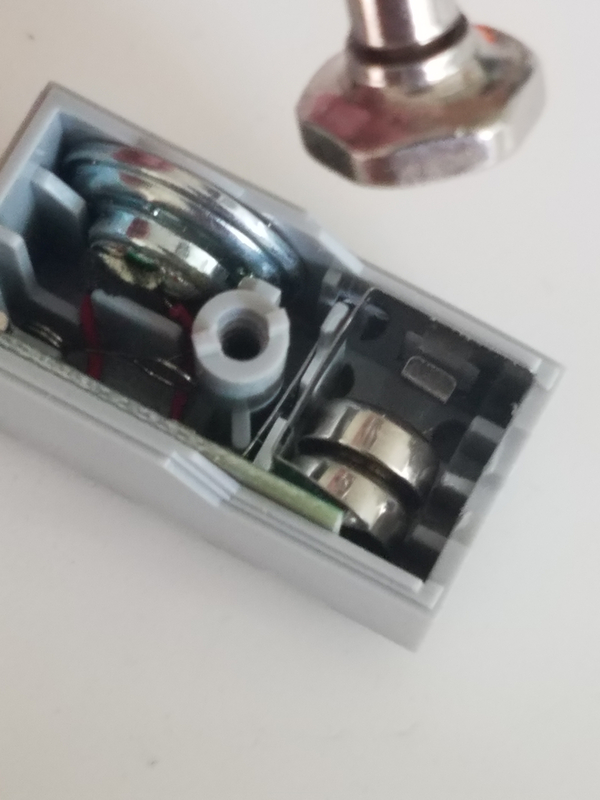 Yes there is another contact, a small folded metal tab that has absolutely no "give" (wont budge), which to me seems to be the problem; if it WOULD yield, the 3 batteries would slip right in. OK, after a good nap I was just now able to complete the stack. It doesnt help that I'm nearly 50 & one needs the eyes, hands, & patience of a surgeon to do the job. 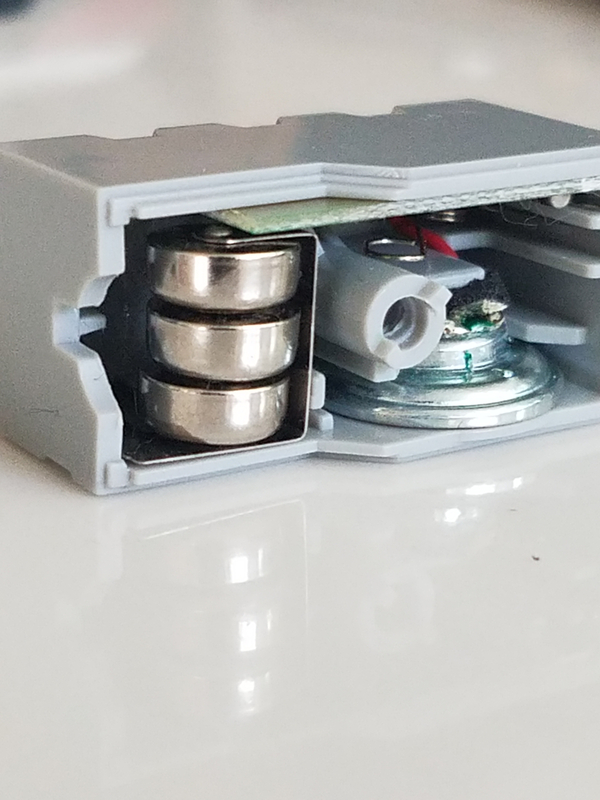 I'm unsure if the batteries are supposed to stay in this "outer" position; right now (as it is in the pic) there is a space inside the brick behind the stack that the top & middle batts will fall into if I turn/set the brick flat. I don't know if it is the perspective, but it looks like the bottom of the bottom battery (as it stands) shorts with the top of the top. Is the bottom battery actually standing on that raised contact? It doesn't appear to be high enough up. I've just re-read that bit. I reckon that raised contact is meant to give a bit, so that all three batteries go backwards, and the pressure exerted by the raised contact keeps the batteries together and also keeps the bottom battery off the other contact strip. 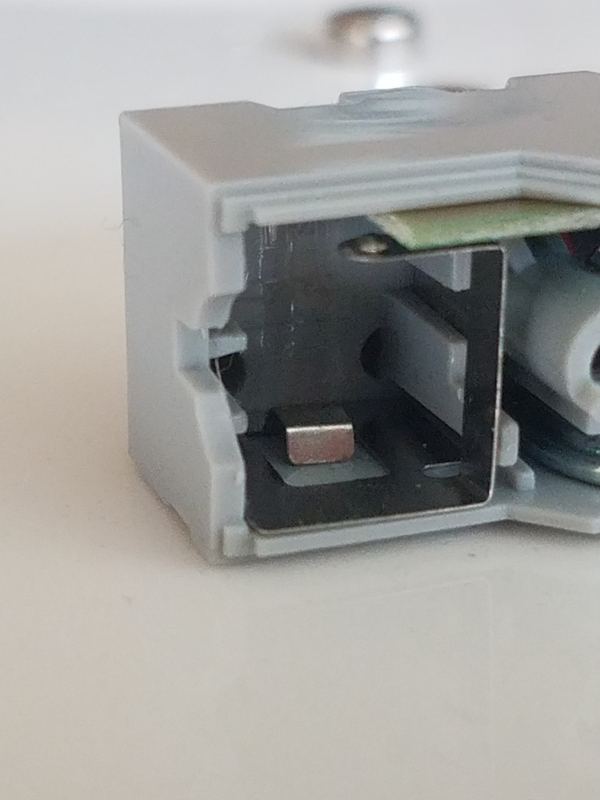 If you have a spare USB phone charger (5V), it might be worth cutting the micro USB end off, then connecting the wires to the two terminals and checking the sounds out. The contact doesnt give without applying tremendous (IMO) downward force when the brick is set flat (see pic). I'm using a small Phillips screwdriver handle as a plunger to press the 3rd/final batt. into place, so all 3 are in there & aligned, but no sound. I'm not sure the batts should be resting on the bottom plastic of the brick's inside. The pic in the carousel manual jpg shows they do, however, to my reckoning. CCC- T.Y.for your help thus far...are the batts inserted correctly in my 1st pic? Flat printed (positive +) side up? I've never actually taken one apart, so cannot tell you what the correct polarity is. But it looks correct, the metal can type bit is +ve and the smaller plate type bit is -ve. If they were the other way up, there is a chance that the +ve edge could touch the metal contact that the -ve is touching, so this wouldn't make sense. So I'm sure you have them the right way around. LR41s are 1.5V each and drop to about 1V when used, so this probably needs 3.0V-4.5V. You should be able to get away with 5V though (USB voltage). If new ones do not work, you could try wiring it up to three other 1.5V batteries externally or a USB charger. It might be best to try it on a cheaper one first though. If you can get it to work, it would be a good idea to record the tune in case it breaks in future. If you have trouble finding LR41 batteries, try looking for Hexbugs at Target. 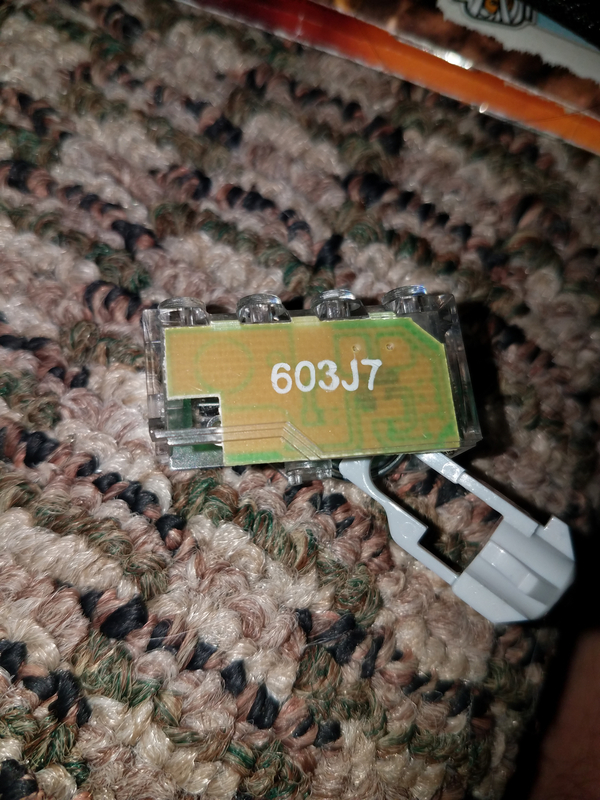 Locally they are tough to find other than the Hexbug batteries. ^+1 to this suggestion. I've gone the Hexbugs route a few times. @gelkster - I recently discovered that the batteries in my grand carousel had corroded/leaked. Fortunately I had some spares as I'd bought a bunch from Amazon recently (for Glimmies - don't ask). When I put in new batteries, all I got was a very faint crackle. I was gutted that the most expensive part of the Carousel was now buggered. However, I took it all apart and carefully scraped any metal bits with corrosion on them with a knife. Reassembled (which took a while as I hadn't taken much notice about how it was arranged to start with). Amazed and delighted when it all worked perfectly. I now store it without the batteries in. I can take a pic of my open sound brick if that helps. Ok the night I initially posted this, my wife had a go & had NO trouble inserting the batteries (despite my admonitions). Not one of the 3 sound bricks worked, so I'm thinking dead batts & I'm picking some up today (datsunrobbie: we have a chain called Batteries & Bulbs that have LR41s stocked). I have the sound bricks from Grand Carousel, Revvin Riders, & a MYSTERY brick I'm excited to discover which it is! But it looks exactly like the Revvin Riders brick. We have Batteries and Bulbs here too, but they get $4.50 each for LR41s when they have them in stock. Target charges $10/dozen for the Hexbug batteries. Never buy 1! I always buy those by the 100 too, I think I paid £3 last time (about $4). I bought 2 4-paks & in effect got 2 free.